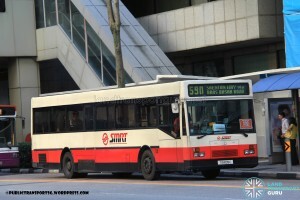 Premium Bus Service 590 is a Premium service operated by Commute Solutions from Choa Chu Kang Crescent to Shenton Way. 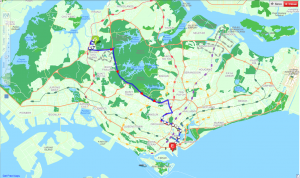 The route passes through Choa Chu Kang North 6/5, PIE, Orchard and Fullerton, operating one trip in the morning. Transfer rebates & concessionary travel are not applicable. 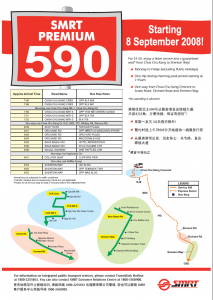 Premium 590 serves the housing estates of Choa Chu Kang Neighbourhoods 6 and 7 with bus connections to Orchard and Shenton Way, eliminating the hassle of transferring between different modes of transport. 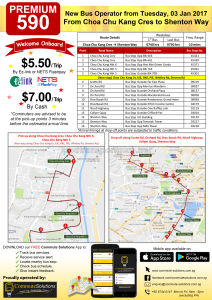 The steep fares and cheaper alternatives make Premium 590 a more expensive alternative route to the city, but passengers get to enjoy the luxury benefits of Premium travel. 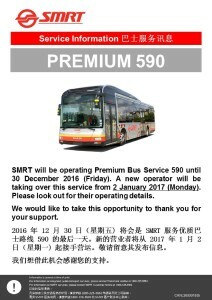 Premium 590 is operated by Commute Solutions from 3 Jan 2017. 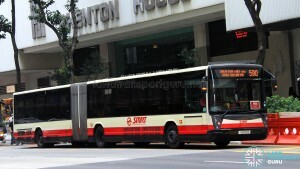 2008 (08 Sep): Introduced as a Premium Service from Choa Chu Kang Crescent → Shenton Way. Charges a flat fare of $4.50. One trip departing at 0745hrs. 2017 (03 Jan): Operations transferred to Commute Solutions. No longer wheelchair accessible.